Bonjour and welcome to the Art of the Home gallery of sunroom design ideas! We handpicked these sun-filled pictures just for you. We hope you’ll enjoy them and that they’ll brighten your day! A bright alternative for increasing your living space, sunrooms are usually built onto the side of the house where one can enjoy and appreciate the outdoors without worrying about rain, snow, wind or too much sun. Sunrooms offer a light and relaxed place for informal entertainment or to enjoy a cup of coffee/tea while enjoying the morning sunrise. It also allows you to reap the benefits of a versatile outdoor living space without worrying about unpredictable weather, insects or bugs while doing some gardening, painting, craftwork or just relaxing with a book. With a beautiful sunroom, you can create your own escape — just like taking a mini vacation while still enjoying the creature comforts of your home. With a sunroom, you get to enjoy the serenity, energy, and beauty of nature 365 days a year. And as you can see from the sunroom design ideas below, sunroom designs can be customized to virtually any shape, style and layout so you are sure to find one that will fit just right for you. Sunrooms often come with wide glass surfaces to maximize natural sunlight (which is kind of the point). However, to improve energy efficiency double pane glass are recommended improved insulation. 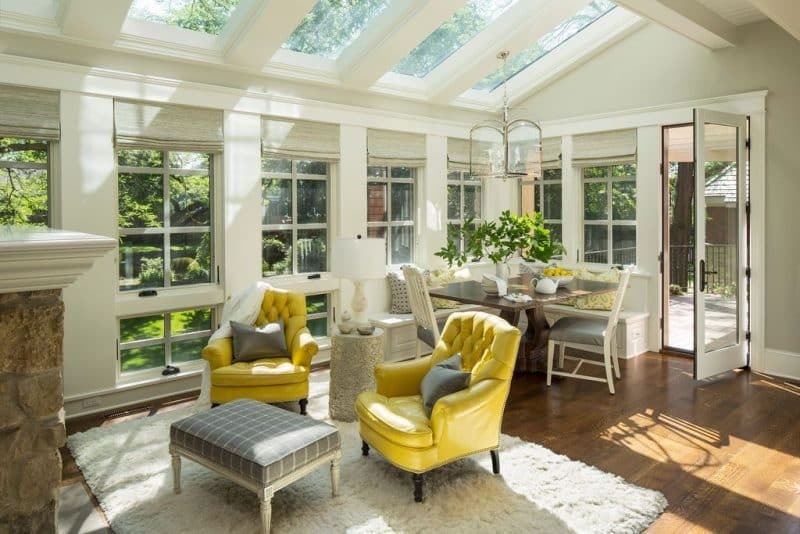 To further increase natural sunlight, glass roofs and skylights are an option. And to keep your privacy when you need it, accessories such as blinds or curtains can be both decorative and functional. Sunrooms can be easily designed to match the house (brick home with brick sunroom base for example) or can be designed using a non-matching material such as in the case of a conservatory type sunroom — a popular option in Europe actually and you will see a couple examples below. As for décor that ties in with the outdoors — flowers, potted plants, furniture made from natural materials and bright colored cushions and pillows inspired by mother nature’s color palette add to that year-round summer/spring ambiance. 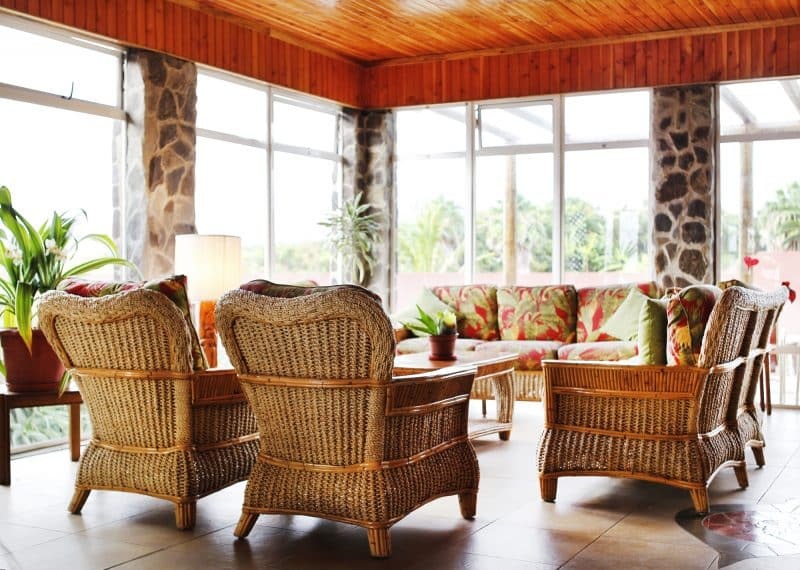 So take a look at our gallery below of seven sunroom design ideas. Hope you enjoy the photos and beautiful day to you! The Little Plus: the built-in breakfast nook surrounded by windows — a cozier alternative to a regular table and dining chairs. How about starting the day here by sitting down and enjoying a healthy breakfast? The glass skylights help by allowing an abundance of sunlight to stream into this space. And do you see the brass and beveled glass lighting fixture? Elegant all by itself, it ties all the glass features of the room together. The Little Plus: the traditional detached greenhouse design of this sunroom is so heavenly. 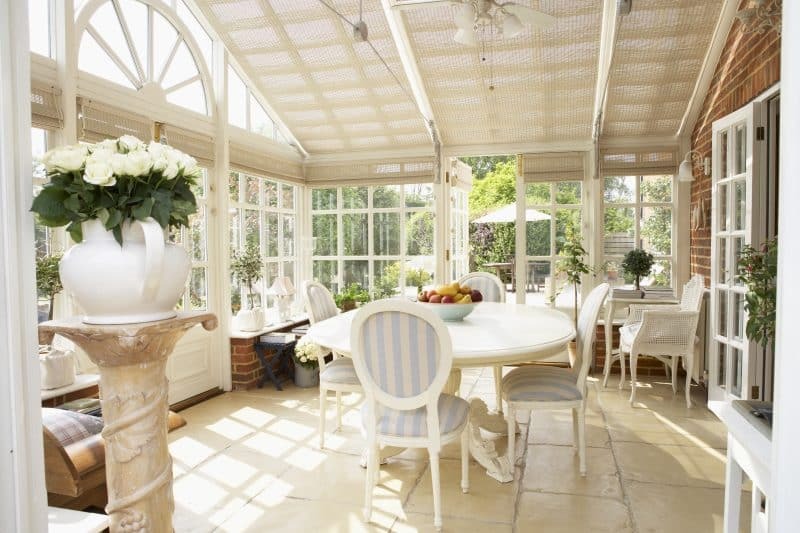 This conservatory design with its segmented metal frames and glass walls pairs very well with the brick floor. 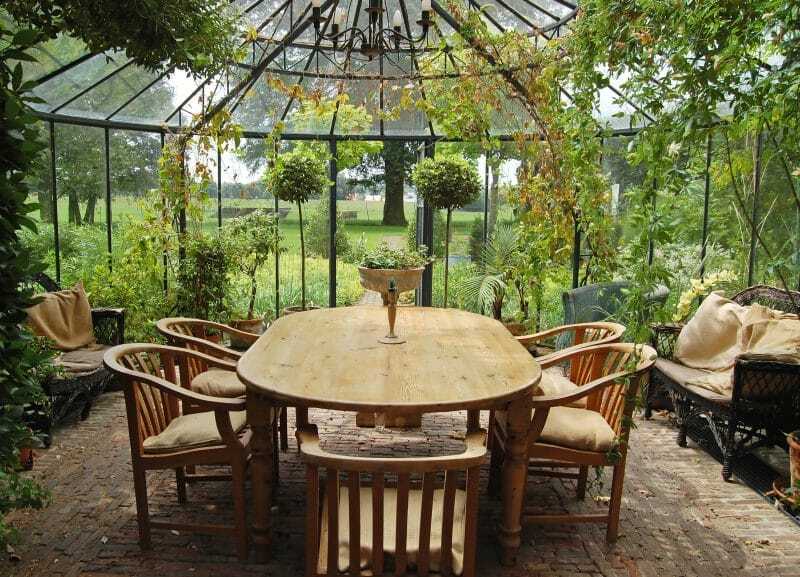 This conservatory design provides a climate for plants and flowers to thrive. And the aged iron chandelier…the dot at the end of this rustic garden statement! The Little Plus: the cobblestone columns — they radiate the timeless charm of durable old world stone. As you look up, the wood planked ceiling adds visual texture and interest, creating the focal point while giving off that beach resort vibe. Looking down, the interesting tile design is a punch of red and brown character that marries well with the color palette. As you look around, the paneled wall of windows can easily turn this room into a cozy warm space or a breezy hangout when opened. 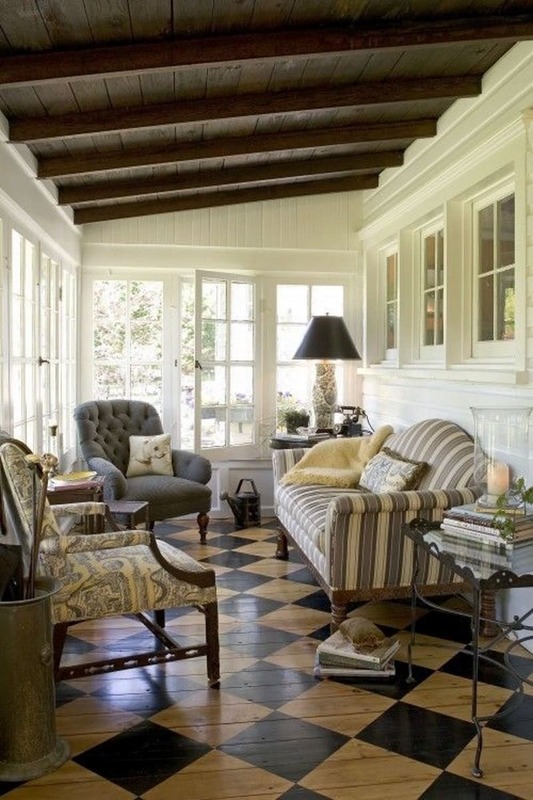 Warm or cool, this sunroom hits the spot! 4. Can I have Your Number…? The Little Plus: the wood plank floor with checkerboard pattern. This sunroom looks larger than it is thanks to its white washed interior and dark wood exposed beam ceiling that pulls the eye upward. The French windows wrapping around the space take in all the natural light turning this intimate shabby chic sunroom into a four-season stay-cation spot! Adding a vintage spin is that antique telephone — anyone remember rotary dial phones?